This is NOT a review of Dollypomskypuppies.us. Dollypomskypuppies.us is part of a criminal organisation which steals money by falsly claiming to sell pets. Dollypomskypuppies.us are advertising puppys for sale online. They use stolen credit cards and invent identities to defraud people shopping for a pomeranian puppy online. The “Scam Breeder” will ignore any questions about their affiliation with any clubs or organisations, and questions about the puppy’s parents. The main focus now is convincing you to pay as soon as possible. The puppy will be shipped to you by the scammers perferred delivery company. There is no other option. If you insist on picking up your new pomeranian they will eventually agree. It makes no difference to them if you travel for 4 hours because they are not at the address they claim to be. Dollypomskypuppies.us will claim to deliver the puppy using a Fraudulent Delivery company which is actually another scam website they set up in order to steal your money by charging for non existent delivery, a air conditioned travel crate, medical insurance for your puppy as well as multiple other fees. To see more scam websites involving pomeranian puppys have a look at Pomeranian Puppy Scams. 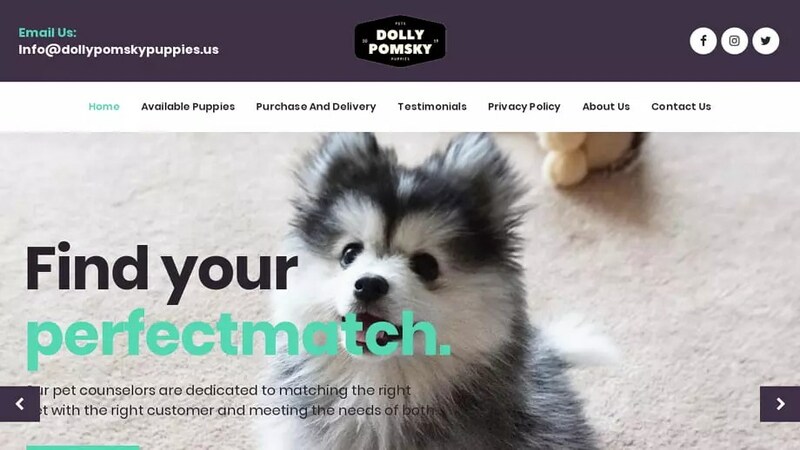 Dollypomskypuppies.us was registered on March 19, 2019 with NameCheap, Inc. . These details are correct as of today (March 21, 2019) but the name and address could possibly belong to an innocent third party if the domain was registered using a stolen credit card. Dollypomskypuppies.us was registered using the email address milkymale92@gmail.com. It was registered and 2 days ago on March 19, 2019 and expires March 19, 2020. To look at it another way, this “company” only started March 19, 2019 and does not plan to be using the website after March 19, 2020 as it has only a 1 year registration. Dollypomskypuppies.us was registered with the domain registrar NameCheap, Inc..
To send an abuse report to NameCheap, Inc. please click the red button below and complete the email to help shut down Dollypomskypuppies.us!